Performance Management System, made easy. Performance Scoring’s Performance Management Application makes performance tracking, management, and improvement simple, quick, and intuitive. Start Measuring What Matters with Performance Scoring. Use peer-to-peer feedback to score employees and vendors on the factors that drive your company success. Capture the performance data that your HR software is missing. My Performance Score objectively quantifies employee performance at each level using the relative performance scoring index. Each user’s score is relative to other users in the same category. The ScoreBoard displays company-wide Performance Scores in real-time. 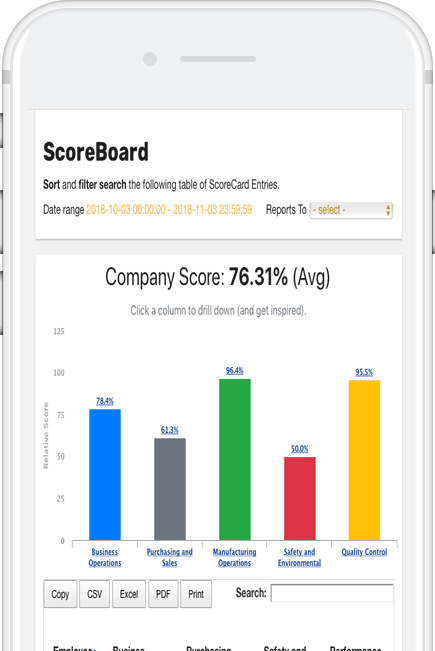 Transparency through drill down reporting to quickly identify performance levels. You’ve spent the time creating an org chart, now put it to use. Your company’s org chart dynamically color-coded by performance. Identify where improvements can be made at a glance. Benefiting every individual within the organization, employee engagement with Performance Scoring delivers real results and increased individual and company performance. Employees perform better, managers manage better, vendors relationships are performance based, and every role has the real-time feedback they need to make the necessary improvements while building greater consensus. When employees know the specific factors that lead to their success, and can see in real-time where they stand, they develop faster and employee retention improves for top talent. Email notifications, Usage Reports, and exportable data keep everyone informed and on the same page. Better communication leads to stronger teams and higher performance. Meetings are more effective, concise, and productive because objective data is shared and helps individuals self-identify areas of need so your company can better perform. Performance Scoring is the perfect employee engagement tool and effective platform to engage and appreciate your employees, allowing them to outperform and over perform. How Will Performance Scoring Effect You? View the features and benefits of Performance Scoring from management’s perspective. View the features and benefits of Performance Scoring from Accounting & Finance’s perspective. View the features and benefits of Performance Scoring from Human Resources’ perspective. View the features and benefits of Performance Scoring from an Employee’s perspective. Perform Better By Measuring What Matters! If someone told you that for the cost of lunch, once per month, each of your employees performance would increase by 15%+…. would you take the jump?